If you knew that a mens claddagh wedding ring would be a heart ring concept, the thought of a man wearing a heart ring might appear a big strange to you. And yet, men across the globe are increasingly wearing gem stone or plain mens claddagh wedding rings. So what exactly is so special about a claddagh ring that, both men and women consider it to be ideally suited for an engagement or wedding ring. One of the most meaningful jewels in history, originated 4 centuries ago. A heart ring that is suitable for both men and women of all ages. The deeper meaning of the ring makes it great for a wedding ring. Kaisilver claddagh rings retain the features of the first ring made centuries. We craft fine rings in both gold and silver, with or without gemstones. You can choose the gemstone of your choice for your ring. The ring symbolizes love, loyalty and togetherness. A 14k or 18k gold or 925 sterling silver men's claddagh wedding ring has the same meaning, we craft both silver and gold rings with the same quality standards ... more. Men prefer darker gems and black onyx is an interesting option. You cladagh wedding ring can be made with or without a gemstone in the center, all ring sizes are available ... more. Here are some important options that you will need to evaluate before choosing a men's claddagh wedding ring. Gold and silver are both perfect for a wedding ring, you can make your selection based on what you like and what your budget can handle. At Kaisilver we provide the same level of workmanship and gemstone quality for silver and gold jewelry. It is quite common for men to choose jewelry based on meaning and tradition, leaving out gemstones is not uncommon among men. Our cladagh rings for men can be ordered with or without gemstones. Meaning and Significance: This is something that actually encourages the demand for a silver or gold mens claddagh wedding ring, so let us talk about this right away. The first claddagh ring was made by an Irish slave named Robert Joyce, this was about 4 centuries ago. Robert was a young fisherman turned slave and was forced to work for a wealthy goldsmith. Despite the horrible and harsh conditions of slavery, Robert could not forget his beloved who was left behind in the small fishing village where he once grew up and lived. The dream of being a free man one day and meeting his beloved gave him the strength to carry on. He decided to make something for his beloved, this was something unique and touching that actually translated his mind and heart into a jewel. When he was actually freed from slavery a few years later, he rushed back to his small village and over thrilled to see that his beloved was still eagerly waiting for him. He gave her the ring and the couple spent the rest of their lives together. The ring came to be known as the claddagh ring. The features of the claddagh ring are very interesting, they remain the same for the lady's or mens claddagh ring. If you see the two Kaisilver mens claddagh rings shown above, you will notice three prominent features. These basically sum up the mind and heart of two young people who truly loved and sacrificed for each other. Though there is a slight difference in the design of the two claddagh mens rings shown above, the heart, crown and hands are common to both jewels. An interesting thing is that, the ring is often referred to as the heart crown and hands ring or the, hands clasping the heart ring. The hands represent, friendship or togetherness, the crown shows loyalty and the heart ofcourse denotes love. If you look at the origins of the first claddagh ring, they were indeed very humble and ofcourse pitiable. But the significance of the jewel makes it one of history's most meaningful jewels. This was a jewel born from true love and sacrifice, not one of those extravagant crown jewels that were plundered from other nations. Gemstone Or Without: It is very true that many men prefer wedding rings without gems or diamonds, this is true of both gold or 925 silver mens wedding rings. 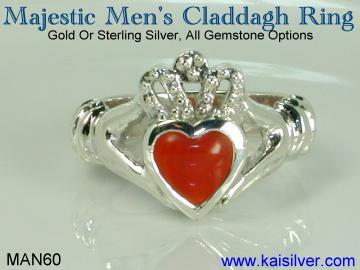 You will be pleased to know that the Kai Silver mens claddagh wedding ring, can be ordered with or without a gemstone. In the case of plain mens claddagh wedding rings with no gemstone, the heart portion would also be made of silver or gold - depending on the metal that you choose for the ring. You should know that, all gems are not priced the same. Some gems like rubies, sapphires, emeralds and tanzanite will show a sharp increase in size (per carat) as the gem size increases. If you see the gemstones in the Kaisilver mens heart rings above, you will notice that the MAN60 is shown with a smaller gem (8mm) as compared to the MAN33 (10mm) gem stone. The fact is that both rings can be custom made with the 8mm or 10mm gems but, in the case of expensive gems like ruby, sapphire, emerald and tanzanite we do not offer the 10mm gem size. This is mainly because, these gems can cost several thousand dollars in sizes larger than 8mm. You can however contact our support experts at sales@kaisilver.com for any specific queries or requirements that you might have. For the gem selection, you could choose a gem by color, budget allocation, birthstone or any other choice. You will not be limited to the gems that you see on our website, we can procure and custom cut the gem from any part of this big planet for you. Our support team will be glad to make recommendations and provide advice even if, you have no intention of making the purchase right now or making it from Kaisilver. Gold or Silver: While many men prefer to wear silver jewelry as compared to gold jewelry, there are today many more reasons to go for a sterling silver claddagh mens ring. Durability is an important factor in all jewelry, this is very true when it comes to men's jewelry. Men put their jewelry through far more wear and tear as compared to ladies. One of the essential features of a mens claddagh ring to ensure durability is, good metal weight. With the steady increase in gold prices, jewelers are struggling to keep gold jewelry prices within buyer budgets. This has resulted in claddagh gold rings for men being crafted with increasingly lower metal weight. Fortunately this has not been a gimmick followed by Kaisilver, we still ensure a gold weight of 20 to 30 grams for your 14k or 18k claddagh mens wedding rings. While this has brought us lesser number of gold ring orders, we prefer to offer value to the buyer. Light weight mens claddagh gold rings will bend or deform easily, this is neither good for us nor for the buyer in the longterm. If you can budget for a gold claddagh men's ring and like the metal, there is no reason why you should not choose a yellow or white gold claddagh wedding ring for men. The hardness of both white and yellow gold is the same as long as, you are making a comparison with gold of the same karatage. For a 925 sterling silver mens claddagh ring, we have some important tips here. It is normal for all silver jewelry to tarnish, fortunately silver tarnish can be easily polished away. Recommended silver polish lotions and even convenient silver polish fabric (pieces) can be used for this. What you need to be aware of rhodium, gold or even platinum platings on your 925 silver mens claddagh ring will wear off in time. Many jewelers recommend push such platings as 'anti-tarnish' treatments. While this is true in the short term, the platings will come off after a while. The problem is that when the plating on your claddagh silver ring for men does wear off, it will happen in bits and patches - not uniformly all across the jewel. For this reason we would recommend that your 925 silver men's claddagh ring be left unplated. Craftsmanship: Good quality craftsmanship is required for more than one reason. While it is normally believed that good craftsmanship only enhances the external appearance of a claddagh mens ring, there is an important point missed here. Firm gem mounting, a smooth finishing with no pointed or jagged edges are all possible only if skilled craftsmen and artisans work on the jewel. While it is true that most jewelers give secondary importance to mens silver claddagh rings, there is no technical reason for this. The higher profit margins of gold mens heart rings, have made jewelers greedy! At Kai Silver we do not play such cheap tricks, this has been true ever since we commenced operations more than a decade ago. We utilise the same production, design and gemstone teams for gold and sterling silver claddagh rings. This proves our commitment to ensure good quality jewelry in gold or 925 sterling silver. We use the services of some of the finest jewelry craftsmen and artisans to craft all the jewelry that we make. Each jewel is given intense and complete attention, and mass production process lines are avoided. Metal Weight: When making a comparison between Kaisilver claddagh rings for men and similar rings, from other jewelry providers, you need to look beyond external appearance. A Kai silver gold or silver claddagh ring would weigh around 20 to 30 grams, we might recommend higher metal weight if the ring size is very large. The urge to produce mens rings with low metal weight is done to please buyers with lower price points. But the fact is that, the saving of metal weight will soon prove to be expensive. Light weight mens claddagh rings are highly prone to bending or denting, this could even result in the loosening of the gemstone. If you are on a budget that does not allow a mens gold claddagh ring with a good weight, consider getting a sturdy and durable mens 925 silver claddagh ring. Make sure that you demand and get a quality silver ring, there is no need to settle for a quality compromise when choosing a 925 sterling silver mens claddagh wedding ring. Kaisilver Rings: We are not the only source for mens claddagh wedding rings but, very few jewelry providers can provide the quality of design and craftsmanship that we do. By fully customizing every ring to suit buyer preferences, we ensure that you get better and longer satisfaction wearing your Kaisilver mens claddagh wedding ring. 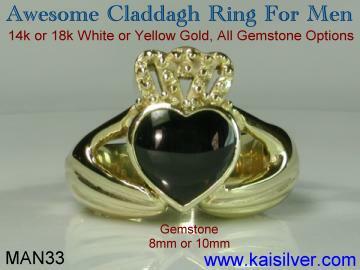 Experts at Kaisilver have conducted indepth research into the history and tradition of the claddagh ring. The entire team including, designers, gem experts, gem cutters and craftsmen have been thoroughly explained the meaning and significance of the jewel. This ensures that our claddagh rings retain all the features of the first claddagh ring made about 375 years ago. When it comes to gem options, no other jeweler can match the range and depth of gemstones that we can provide. With direct links to gem mining sites in every part of the globe, we have preferential access to more than 200 million carats of gemstones. We can procure and custom cut any gem found on this planet for you. The above report is not aimed to push you into making a purchase. All we expect is for you to have a good background of what to look for when evaluating various options. We custom make all types of jewelry with your designs or ours. You can choose gold or sterling silver for all jewelry and select the gemstone of your choice too. We will have absolutely no problem if you communicate with our support team to have all your doubts and queries cleared - even if you do not make the final purchase from us. We do hope that you have found the above information to be both useful and interesting. Should you ever need any information related to gems and jewelry, feel free to email the Kaisilver team of experts at sales@kaisilver.com We can produce just about any custom jewel with the metal, dimensions, gemstones and design that you require.